The WV Legislative Redistricting Office uses GIS to update Congressional, State Senate, and State House of Delegates District boundaries and supplies information to the U.S. Census Bureau and local communities, districts, and counties. Office of GIS Coordination > GIS in WV > What is GIS? Geographic Information Systems (GIS) is a technology that incorporates the collection, analysis, and display of data that has a geographic location associated with it. GIS allows you to explore spatial trends in information and visually communicate information that can support and improve decisions. GIS technology is used in many different fields such as public health, natural resource management, economic development, homeland security, and many others. The components of a GIS include hardware, software, data, protocols, and people. While all the components of a GIS are important, the successful management, collaboration, and cooperation of the people involved in the development and implementation of geospatial technology is critical. GIS mapping involves data that has locational properties which determine where it appears on a computerized mapping interface, as well as other data attributes which provide additional information associated with a particular location such as the population density of a county, flow rate of a stream segment, or owner name for a parcel of land. Spatial data are shown on a map as data layers which can be turned on/off, symbolized, queried, analyzed, and edited in various ways depending upon the application. To learn more general information about GIS, visit the WV GIS Technical Center or ESRI's general GIS page. 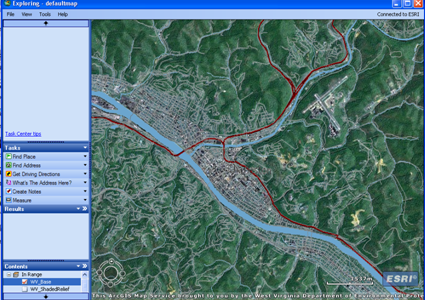 The graphic below is an example of imagery, transportation, and hydrography layers combined in a web mapping interface utilizing ESRI's ArcGIS Explorer and a live connection to GIS data served by the WV Department of Environmental Protection.